In order to be considered a supreme rapper, you've got to have a slick mouthpiece. And no one in the rap game has a mouthpiece slicker than Suga Free. Respected in the streets and by artists alike, Suga Free has appeared on albums from Snoop Dogg, Xzibit and Lil Jon, among many others. After making hits with long-time recording partner DJ Quik, the Pomona-based rapper strikes out on his own with his tremendous third album, Just Add Water. Full of razor-sharp wit, lyrical pimpery and musically advanced production, the stunning collection sums up Suga Free's perspective on life. "Whatever the problem might be, kick back for a minute and analyze it instead of going off at the moment or reacting heavily," Suga Free explains. "Just add a little water and make it easy for you to deal with." Suga Free's addictive music is especially easy to deal with. Lively street single "You Know My Name" details his affinity for pimping and displays his next-level lyricism. "I wanted to put that one out there just to let them know that I was coming," Suga Free says. "I'm on my way. The timing is always good for a brother spitting some game across the microphone because we live in a land of gangster rappers." Nonetheless, music icon and preeminent gangster rapper Snoop Dogg teams with Suga Free on the silky smooth "So Fly," an ode to both of their stylish ways. Suga Free then freaks his signature brand of pimpnosis over a wicked, Middle Eastern-inspired beat on the intense "Like What" and explains the ins-and-outs of pimping on the sonically laid-back "Now That I'm Gone." 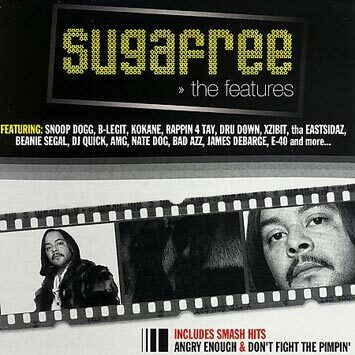 Each of these songs, like the rest of Just Add Water, are loaded with Suga Free's unparalleled humor. "I'm a jokester," he explains. "I like comedians. I'm a huge Richard Pryor fan and for a long time, I didn't realize how funny my stuff was when it came out." But as funny as Suga Free can be, he also can be serious as a heart attack. He flexes his artistic reach by rapping in his normal and in a falsetto style on the elegant, guitar-driven "The Ranger." After hearing the beat and while conceiving the song, Suga Free let his guard down, not allowing anything to bother him for an entire week. He dug deep into his emotional core, resulting in one of the most powerful, lasting songs of his career. "I can't stand being lonely," he explains. "I do not like being by myself. I don't like being home alone or being anywhere by myself. But then, other times I don't want people around me and I'll go be by myself. I don't think anyone likes to be too lonely. Pimps are some of the loneliest cats on the planet. I was kind of leaning on that with "The Ranger." Then, Suga Free approaches the opposite end of the lyrical spectrum by addressing domestic strife on "Why Are You Talking." "I was dealing with personal stuff," Suga Free says. "What are you talking upset because you're closing the cabinets too hard in the house. Baby, are you all right? Are you cool? You can't tell me what's really going on? Is your moms OK? We can step to the side. The kids don't have to hear us discussing like this. Lower the tone in your voice. I'll respond better if you take some of the bass out your voice." It's the typical stuff a cat goes through at the pad." In addition to Suga Free's incredible lyrical display, Just Add Water shines like the Milky Way because of the top-notch music supplied by a host of up-and-coming producers. Freeze, Tony Ruffin and Big Saccs are among the promising new beatsmiths who breath sonic breath into the album. Growing up in Oakland and Compton before settling in Pomona, Suga Free got his introduction to music through his father. Rock acts Steely Dan and the Rolling Stones were among some of his early musical influences, but rap eventually became his passion. At 15, Suga Free was already catching wreck on the microphone with his friends. A few years later, he caught the ear of one of DJ Quik's partners. "I rap because I can," Suga Free says now. "When Black Tone and them found me, they heard me rapping on a tape. They asked me if I wanted to make records. I said, "Why not?" And here I am." Suga Free released his debut album, the acclaimed Street Gospel, in 1997. Suga Free's second album, New Testament, arrived in 2004. "There was a lot going on," he says, "accepting this business, accepting this life, how it affected the pimp game and how the pimp game affected the music business"
He's going as far as building a music studio for himself in Big Bear, California, taking advantage of his natural beatmaking abilities. "I figured that if I could make beats on the walls or on a jailhouse block, I could do it on an MPC, "he says. "We're finna get in there and get real musical. I've latched on to this." "I'm happy to be in control of my situation this time," he adds. "These are my brains, my ideas, my thoughts and it was my way. I'm like the Johnny "Guitar" Watson of rap music. Straight pimp."